Leith Late is an arts organisation that puts together an annual public event of music, visual arts and performances along Leith Walk. From the 25 events and exhibitions of its 2017 diverse programme, three were my personal favourites, all different but equality unique. 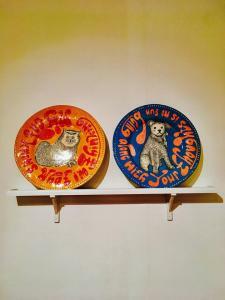 On the opening day I visited Edinburgh Printmakers for Dr Eric Great-Rex’s My Cat Knows What I’m Thinking, an exhibition of ceramics and prints inspired by the artist’s habit of talking to his cat about his life, making his artwork a medium of the sentimental value of animals and objects. 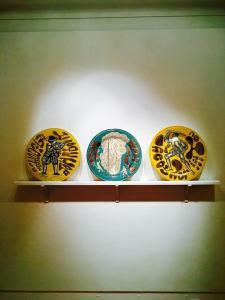 His psychedelic patterns reflected a timeless quality, looking as they could have been made centuries ago. The London-based artists has worked in this studio, which opened its gates to guests as part of Leith Late Festival, introducing techniques and equipment serving more than 400 artists, being the biggest printmaking studio in the country. On the same night I discovered a video installation, hidden in Trinity House’s basement, creating a very uncanny feeling the moment I walked in. 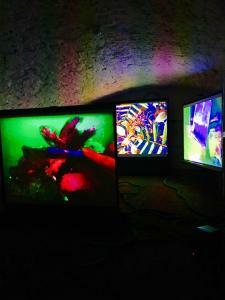 Junk Ecology by Clara Hastrup, was a multimedia installation of video and sound. The 4 dream-like, surreal videos projected distorted qualities of everyday objects in unexpected environments; a tea bag wandering in the desert and then immersing into a lake, sweet icing on top of mountains, singing glasses sounds coming from fingers playing with craters, a rose drowning in a tornado, a toothbrush cleaning corals in the sea. The result was very hypnotising and satisfying, one of these artworks for which a glance is not enough. On the closing night it was time for an audio visual show! The sound artists The Reverse Engineer, in collaboration with the filmmaker and photographer Ian Dodds transformed Leith Depot into a stage of mesmerizing microcosms and ambient soundscapes. It felt like sounds were moving in slow motion creating chapters of visualising dissolution. Ants submerged in liquid and human hair dancing with the wind succeeded fabric bugs and eyelashes shadowing a human eye that was chancing with the light. 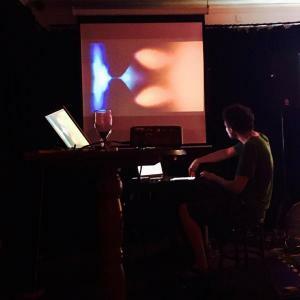 A bodily discourse of mortality integrated within electronic improvisations. Leith Late Festival was another proof that Leith flourishes, coming on strong to rock the boat and become the next cultural nucleus of Edinburgh.